The 3i-3424-12BC iSeries crossbow case features a molded-in hinge, patented trigger release latch system, comfortable, snap-down rubber over-molded cushion grip handle, automatic ambient pressure equalization valve, resistance to UV, solvents, corrosion, fungus and impact damage, four in-line wheels for easy transport and cubed pick-and-pluck style foam which enables users to customize their interior to ensure a precise fit for most crossbows and gear. 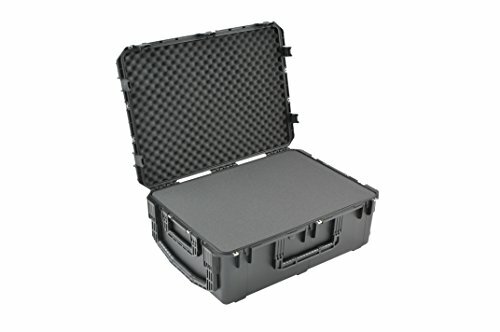 This case is molded of ultra-high-strength polypropylene copolymer Resin, featuring a gasketed, water and dust tight, submersible design that is resistant to corrosion and impact damage. Interior dimensions: 34.50" L x 24.50" W x 12.75" D.
If you have any questions about this product by SKB, contact us by completing and submitting the form below. If you are looking for a specif part number, please include it with your message.